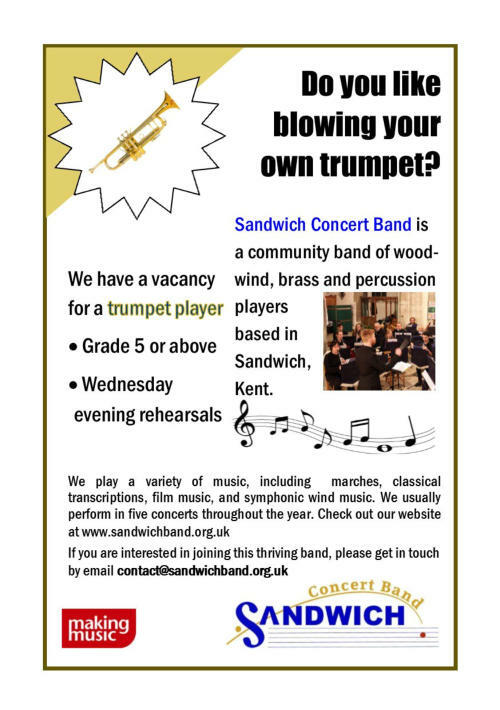 The Sandwich Concert Band is a community organisation constituted through Making Music and welcomes young and not so young players of wind, brass and percussion instruments without audition. Nonetheless we strive to perform at a high standard and ask that Concert Band musicians are at least Grade 5 standard for section players and higher for solo parts. 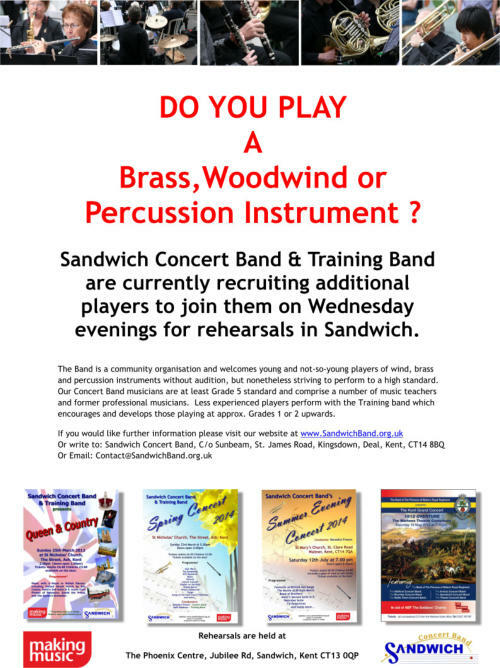 Less experienced players of all ages between Grades 1 or 2 through to 4 can join the Training Band and progress to the Concert Band. There is usually a mutual trial period of 3 weeks where each of us can assess the other. Please don’t be put off by this, we’re a welcoming and supporting bunch and it’s very rare that we can’t accommodate players within our sections! Although we are a wind band, keyboard and string players have joined us in the percussion section and we would welcome more! 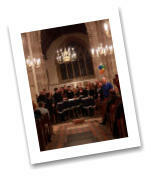 The Band own timpani, kit and assorted other percussion – they just need players! We currently have vacancies in all sections but especially for the following instruments: Bassoon Alto Saxophone Tenor Saxophone French Horn Trumpet Cornet Trombone Euphonium Tuba Percussion including Kit & Timpani Rehearsals are held on Wednesday evenings at the Phoenix Centre, Jubilee Road, Sandwich, CT13 0QP • Training Band meet between 6 and 7pm • Concert Band arrive at 7pm for prompt 7.15pm start through to 9.15pm. There’s a break at around 8pm. If you’re interested in coming along, please contact us so we can make sure there’s someone to welcome you and get a chair and music prepared. (Click Here to view map) We look forward to seeing you!